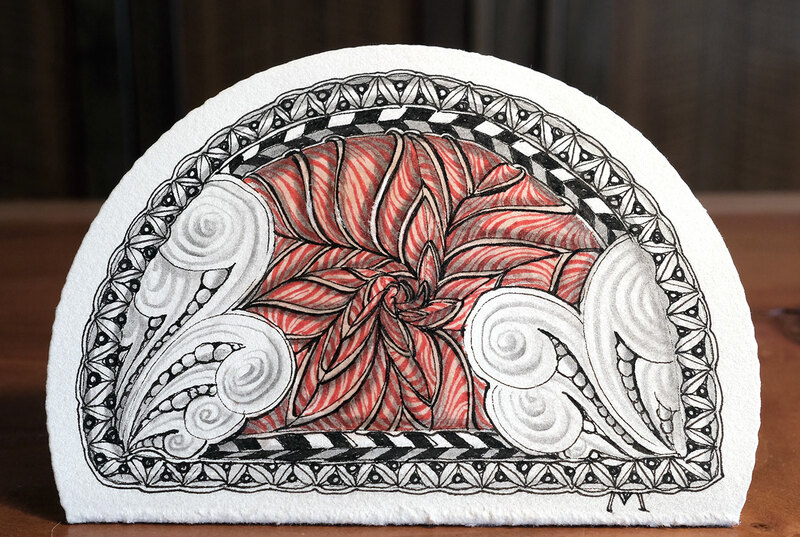 We always say that the Zentangle Method attracts really awesome people. 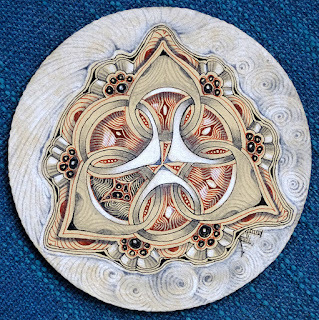 We have had the pleasure of working with wonderful Certified Zentangle Teachers (CZT) all over the world and we are excited to share these wonderful people with the entire Zentangle Community. 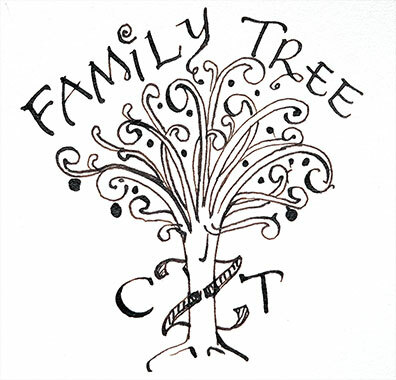 Through our new series, CZT Family Tree, we will introduce individual CZTs. 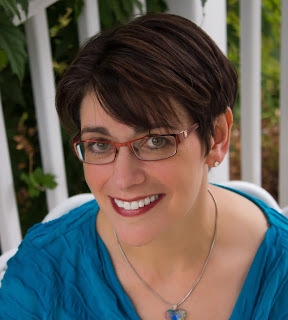 Today, we are excited to introduce Elisa Murphy. My super sunny back porch! It's at the top of a hill so it feels like I'm sitting in a tree house. I love being in my PJs, grabbing my quilt, huge cup of coffee, lap desk, tangling supplies and heading out there to snuggle and tangle. For me, it's all about metaphors and philosophy. I think about the cues I give while teaching a class and challenge myself to carry them over into my thoughts. Here’s a quick example. The tip of the micron pen is super delicate. If you press down too hard on it, that nib is going to bend and feel nasty to tangle with. Like the micron pen tip, if I try to force the way I want things to go, sometimes it just doesn’t work. If I ease up and give life room to “ﬂow,” my experiences might just be a little easier. This is going to sound weird, but my favorite memory about a Zentangle class hasn’t happened yet! I’m writing this in February. 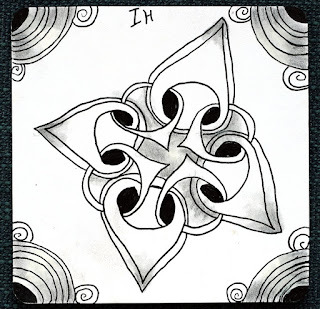 I can honestly tell you that my favorite memory about teaching a Zentangle class will be on March 10th. Let me explain. Two weeks ago a woman from my youngest daughter’s school PTO (parent teacher organization) asked if I could teach a fundraiser for their school. I was psyched! 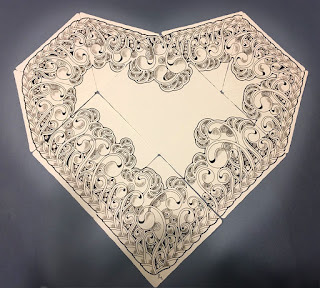 So many parents at school have voiced curiosity about Zentangle but have never made it to a class. This fundraiser might be the motivation to ﬁnally get some to try it out! I got my calendar out and asked for the date. March 10th. UGH. FULL STOP. Here’s the thing. I have two daughters. I always will. My youngest daughter, Hannah, is 11. My oldest daughter, Rachel, died four years ago. March 10th is her 18th birthday. So now what? What do I do? After an emotional and loving conversation with my husband, I reached out to my fellow CZTs on social media and ﬁlled them in. The response that I received was breathtaking. CZTs who I know and others who I’ve never met reached back with support and solid, thoughtful suggestions about how I might weave something about my kiddo into the class as a private way to celebrate her. One CZT then gave me the “Ah ha!” thought that I needed. She asked (paraphrasing) wouldn’t it be a beautiful gift from your daughter if you teach this class and there’s just one person that comes who really needs it? Yup. She’s right. That’s why I became a CZT in the ﬁrst place. I want to make a difference and help. I started practicing the Zentangle Method while trying to ﬁnd some grace and direction. The possibility of teaching a class on Rachel’s 18th birthday and possibly introducing some of that grace to another who really could use it? That’s priceless. The class is scheduled. This – the class that hasn’t happened yet – in my opinion is the Zentangle philosophy coming to life. The product (teaching the class) isn’t what’s important. The true beauty is in the process. I’m challenging myself to grow in a way that has me feeling excited, but also vulnerable and uncertain. Not only my husband, but also my CZT family, near and far, showed up and reminded me how beautiful the growth process can be, while still acknowledging the struggle. 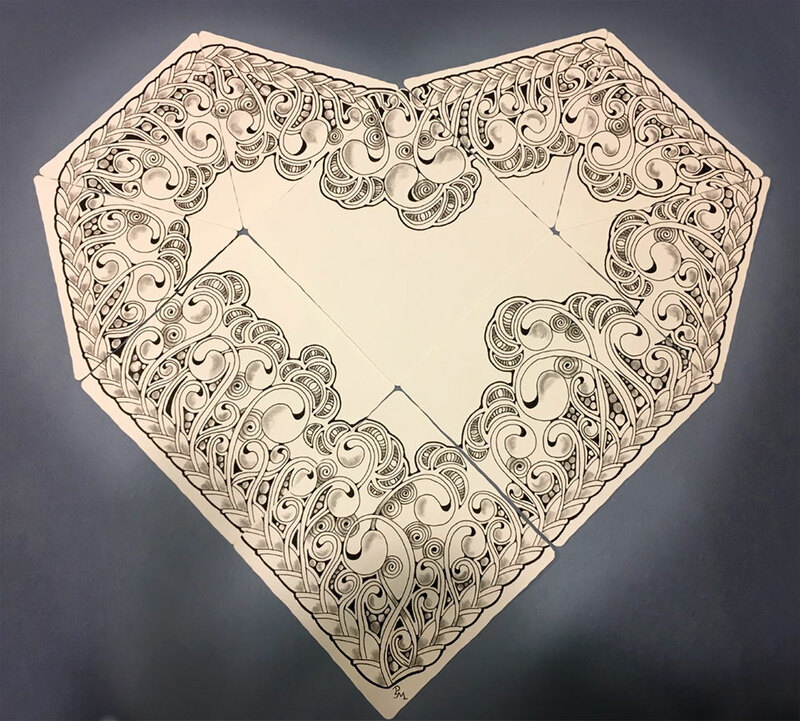 I am truly blessed that when I think about the classes I’ve taught, I am in awe of the connections and joy they have brought as I share the Zentangle Method with others. This one’s different though. Deciding to teach this class challenges me to my core. It’s a huge step in my quest to ﬁnd grace as my journey continues without one of my children here to kiss goodnight. With the love and support of my Murphy family as well as my CZT family, this is by far the most powerful CZT experience. On top of all that, I’ve already discovered that there is a person coming who just might be that “one person who really needs it.” How cool is that? I have learned to measure my success as a teacher by the experience folks have, not how closely they follow my instructions or how their tiles look. If a student leaves my class feeling a little better, a little more conﬁdent, a little more peaceful than when they walked in the door, then THAT’S my success. That’s why I do this. You will find me taking care of my family, volunteering in the community or desperately attempting to ﬁnd the secret to effective time management and focus. I’ve decided to take my teaching to a level beyond “hobby” and into a successful business. It’s totally out of my comfort zone but that’s where the growth comes in. Thank you so much, Elisa! We look forward to sharing more CZT stories in future blog posts. On a "clear" day . . .
Before I started my stationery company, Pendragon, Ink (many years ago! ), I used to do a lot of painting. Painting was always fun. It kept me excited about life and and always thinking of the next canvas to cover or series to start. In a painting mindset, I noticed everything and was constantly ​taking notes or making sketches for the next day's endeavor. One of my favorite parts was at the end when I often added a coat (or two or three) of gloss varnish to the surface of my (dry!) finished piece. Just so you know, this is an occasional personal preference, not an absolute. I am not suggesting one has to varnish all their art! But this is an element on my palette of choices that I like the look of. I like how it can add depth and richness and increase color saturation. With a few coats it resembles those beautiful old paintings in museums that I love. Imagine, for example, an old table that you have just sanded, the wood all bare, and then you add a coat of varnish/shellac/urethane . . . what a difference! Anyone who knows me, knows how quickly I do just about everything . . . I eat fast, cook fast, sew fast . . . well you get the picture. I paint with acrylics instead of oils for the same reason . . . Speed! But to me, acrylics seemed a bit flat or dull, so the varnish provided a look that the acrylic paint alone could not. I was thinking about this the other day while I was tangling. "Hmm, I wonder what would happen if I varnished a tile?" But just to varnish a tiny tile every time the need arose would be a lot of work and clean-up . . . not what I wanted. So I tried something different. I grabbed a bottle of clear nail polish and went to town! It was a dream come true! Here was this miniature handy-dandy brush, right in the the bottle, just the right size and I did not have to clean it afterwards! I had so many half filled bottles of all kinds of clear coats. The one I used here has a very subtle pink tint to it, just a whisper. But it brought out a whole new feeling of life wherever I applied it. You can see on this diptych (a 2-paneled artwork) . . .
. . . that I varnished the right side panel, and not the left so you can see the difference. On this next heart piece on which I varnished the upper left corner . . .
. . . to create a dramatic difference dark to light. 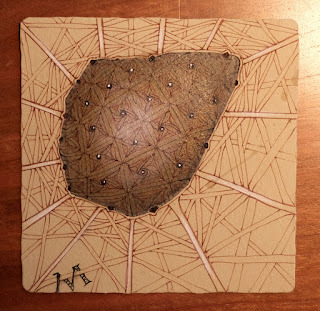 Next, I was experimenting on a tan tile, (one I had in my collection, that I did not mind if I screwed it up) and just varnished the "orbital cone-shaped whatch-a-ma-callit" in the middle. It was pretty dark to begin with and got darker. When the coats were dry, I went back in and added white dots on the surface, and they just popped right off the paper! 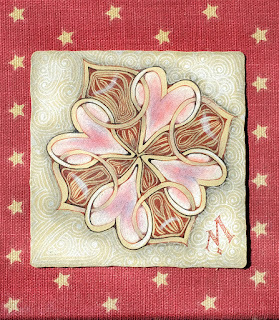 If you decide to try this, start with a tile you don't mind experimenting with. You don't have to cover the whole tile. In fact, on each of these I only varnished small portions. I liked how it was more interesting than covering the whole tile. That marvelous feeling I got from varnishing my old paintings returned. . . like a dear old friend. . . . I'm not going to do this to all my tiles for sure, but once in a while it might be cool. It's just a nice addition to my growing bag of tricks! What have you added to your bag of tricks that you can share with us? 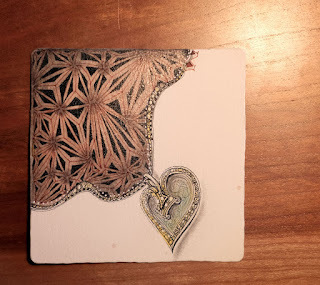 In my readings lately, I discovered that Zentangle is quite "hearty". . . and in more ways than you might have imagined. Nourishing I think, most of all, nourishing. It feeds our heart, frees our emotions. It supports our needs, wants and enhances our lives. One needs heart to create beautiful things. And in my heart, I just know these things. In our English language, "art" is found within "heart." 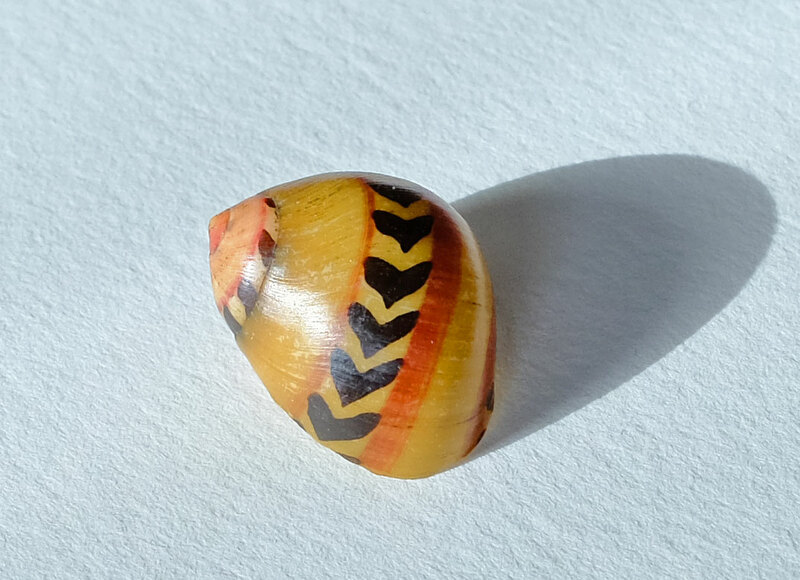 What a delicious metaphor for "drawing" on your heART's inspiration. 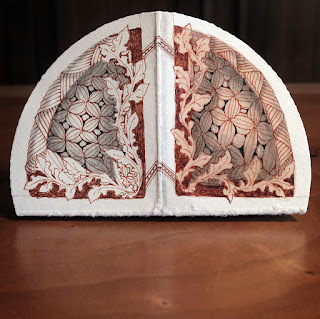 How do you access heart-felt art? 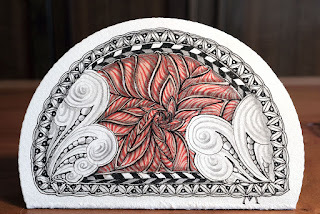 Our Zentangle suggestion is to do it one stroke at a time. Put your heart into each simple stroke with deliberate and loving attention. Leave the next stroke's concerns to the next stroke. When it's time for that next stroke, approach it with an open heart. Gently allow your heart (and mind) to open to what unfolds as you tangle and be gentle and relaxed about your expectations. As you practice the Zentangle Method you begin to trust your heART more and more. You learn to trust that you'll know what to do when it's time to do it. You begin to discover the beauty that flows from within. You discover how good that flow can feel. This blog post is the companion for this newsletter. If you are not yet a subscriber, you can still download the app for free and search that hashtag to see what everyone posted. And for some more definitions . . .
Heartstring: hmm . . . what's your definition? 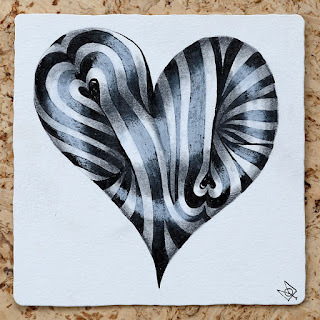 Why are Zentangle Mosaics Fascinating? I love the fountain pen Maria gave me for Christmas. I keep that pen and a blank book with me all the time to capture ideas that suddenly sparkle but which can, just as suddenly, vanish dream-like without a trace. So now I write whenever an idea sparkles. And as I write, that initial spark usually sparkles other ideas and I write those, too. When I tangle, I never know where my starting strokes will take me. But I trust the process and proceed one stroke at a time. I’ll write the same way – one subject at a time – and together we can watch where this takes us. 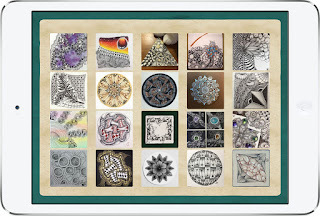 To answer the questioning title of this essay, “Why are Zentangle mosaics fascinating?” I suggest that Zentangle mosaics are fascinating because each tile is unique. If you’ve had the pleasure to be in a Zentangle workshop with a CZT* and placed your tile in a mosaic, you know how good that feels. At that moment all your self-criticism chatter disappears. Your tile remains unique, yet it fits the overall mosaic beautifully. And when you think about it, that mosaic exists because it contains each person’s unique expression of his or her creative flow that could only have happened at that moment. In other words, because your unique tile is there. 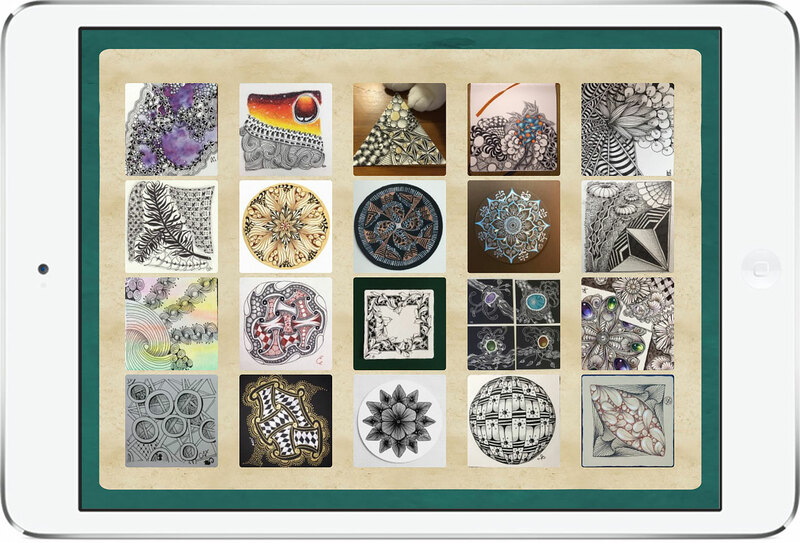 That good feeling inspired us to create our Zentangle Mosaic app with its Waterfall mode where tiles flow in and out of a mosaic that fills your screen. If all the tiles in the Waterfall display were the same, there would be no reason to keep watching it or to scroll through it. 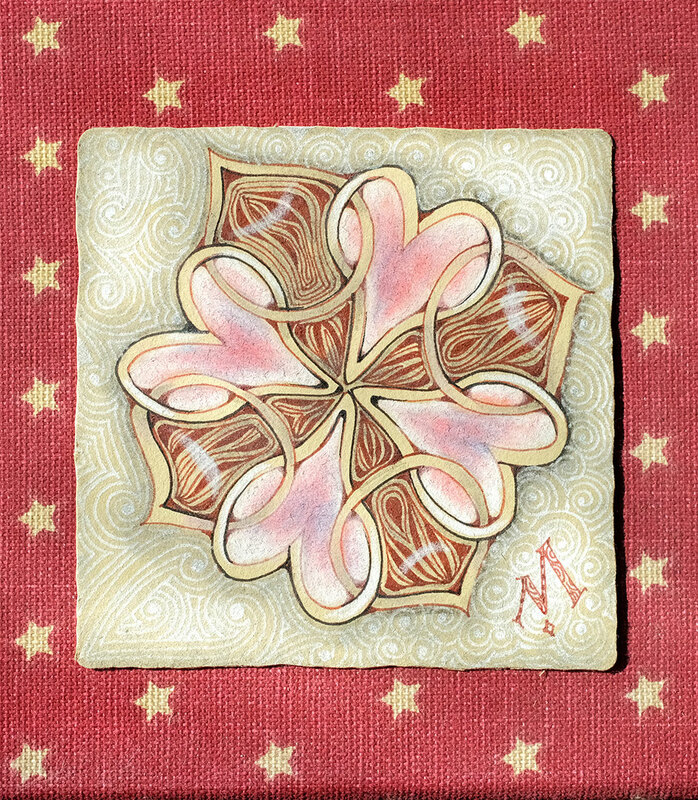 A Zentangle tile does not need to meet some standard of excellence to be part of a mosaic. And, who would even begin to judge that? 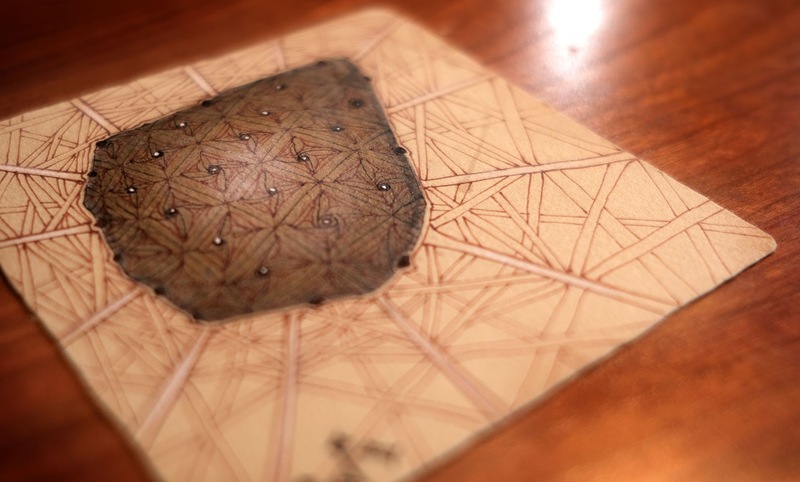 Your objective in tangling is not to create the perfect tile. Your objective is to enjoy that exhilaration of creativity that flows as you make each pencil or pen stroke and then discover where those take you. 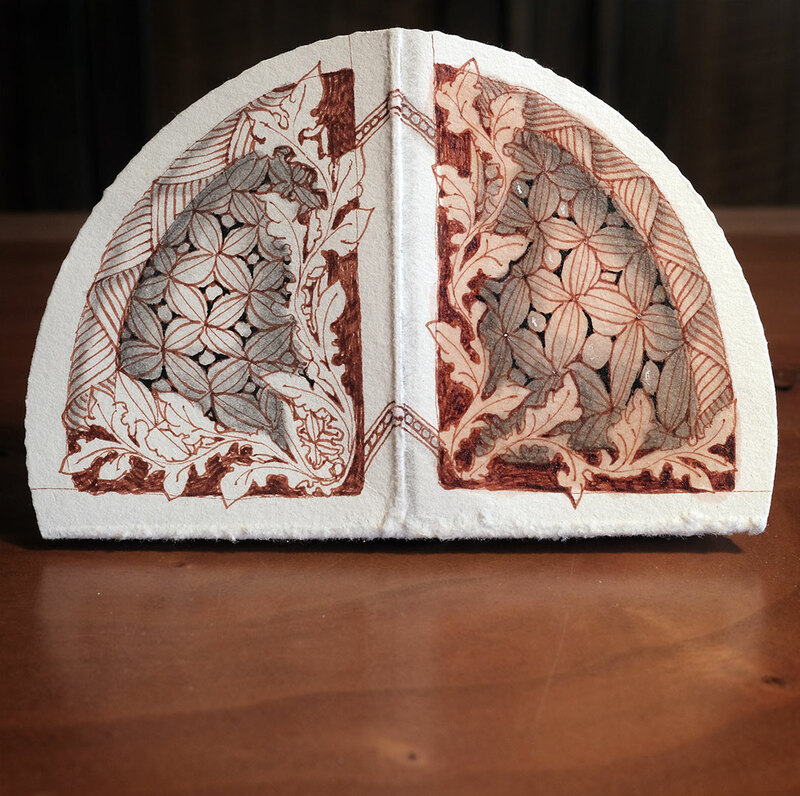 Admire your tile as you turn it this way and that. Then place it in the mosaic . . . a mosaic that is uniquely beautiful because of your tile . . . a mosaic that could not exist without your tile. Without your tile, that mosaic would not exist.